The ANTI-MODE 2.0 DUAL CORE from DSPeaker. The “2.0” in the product’s name refers to the fact thatthis is a two-channel device; “Dual Core” refers to its use of two VS8053 IceDragon chips as processors. 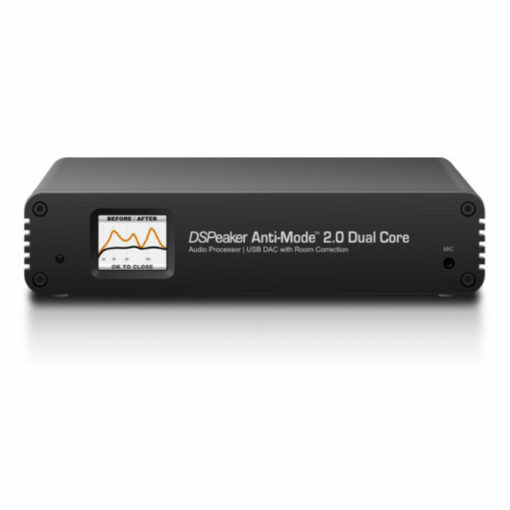 There are XLR and RCA analog inputs/outputs; digital audio (TosLink S/PDIF) input/outputs; a USB connector for USB audio mode, firmware updates and data downloads; and a datalink connector for linking multiple Anti-Mode 2.0s. This remarkably flexible device can offer dramatic sonic improvements, and does at relatively le cost.